Night Weaning Quiz: Is Your Baby Ready For Night Weaning? The answer, of course, varies from baby to baby. So much depends on age, but we can’t offer a simple ‘if your baby is this age, then yes, it’s time for night weaning’. Because we have to account for health factors, too – some babies simply need night feedings longer than others, especially if they have medical problems. And parent preference plays a huge part in this as well – some moms want to hang on to night feedings even after they’re no longer “necessary”, simply because they love that special time with their child! The night weaning question has come up often enough recently, however, that we thought it was time we brought you this great tool to help you get a better sense of whether or not you and your baby are ready to night wean. Take this simple, 5-question quiz, and learn whether or not night weaning is something you can consider right now. Night Feedings By Age: When Do You Night Wean? How Does Night Weaning Affect Sleep? The quiz below is very easy to take – only 5 questions, and you simply need to mark a number from 1-5 for each question. Once you have answered each question, click Submit. Night weaning isn’t always easy, even if you know your baby is ready and have read all the right baby sleep book. You may need night weaning help – and we offer just that! Our team of caring and compassionate consultants is ready to provide the personalized help you and your family need. Your consultant will provide you with your very own Personalized Sleep Plan® which contains specific night weaning plans and schedules. Have an interesting night weaning story? Already a night weaning champion? Share your tips with us! Night Weaning vs. Sleep Training: Which Should Come First? My son is almost 9 months old. He can put himself to sleep. He breastfeeds at least 5 times during the day and eats 3 meals of solids though he isn’t what I would call a stellar solids eater yet. Sometimes he eats his solids really well and other times he’s not really interested at all. He is a very healthy baby and is in the 75th percentile for weight. I have never struggled with having a low milk supply. Anyway, he had been sleeping through the night without waking to feed most nights for several months but at around 7 months old he started waking once (sometimes twice) in the night again to nurse. The times of his waking(s) vary substantially (anywhere from 12am to 5am). In the last month and a half there have been maybe 3 nights that he has slept through the night but the rest he has been up at least once to nurse. I have been just going along with it thinking that it could be because of teething or a growth spurt or something, but it seems to just be lingering. I am wondering if you have any tips how I can tell if he is truly waking because of hunger or if perhaps he just wants the comfort of nursing. Perhaps I need to try to get him to eat more during the daytime too. Thanks for writing, and sorry to hear that you have been struggling with those night wakings again! How did he score on our free night weaning quiz? That should be a help. Feeding more in the day is always a good idea when working on night weaning, as is a high protein snack before bed. Without having a sleep consultant take an in depth look at everything sleep related and his schedules too, it would be hard to diagnose any further. If you’d like help with gently night weaning him, please consider our Members Area or a one on one consultation package where you will be able to speak with-write to one of our experts! Feel free to contact us with any questions, and good luck! Hi my baby is 6 months old and is on solids 3 times a day, plus milk for breakfast, twice mid-day and once at night before bed. We put him to bed while wide awake by patting him in his cot coupled with white noise, which we leave on through the night. But he wakes every hour. When he was younger he could even put himself to bed at night but was still waking through the night. I’ve tried feeding him in case he’s hungry, then I tried not feeding him cause the feeding didn’t fix anything, but he still keeps waking. Why so since he doesn’t have sleep associations going to bed? What can I do? I already made a comment above storry I forgot to say my 1 year 3 months old baby will cry his heart out when I try to deny him a night feed. Some nights its my nightmare being pregnant also, you understand!!!! My baby is 7 months old, she has 3 solid meals per day, 1-2 snacks per day as well as 5 good breastfeeds per day. She self settles to sleep, has regular routine however still wakes for 2 feeds overnight plus sometimes wakes and requires resettling at night as well. She puts on weight and sits on the 25th percentile however never jas huge weight gains and when she doesnt sleep well she may not put on weight at all. I feel for my own sake and for hers I need her to improve her sleeping. Currently she goes 6 hours before her first feed. I am unsure if I should drop this first night feed and continue the second and how I should do this. @Lauren – Thank you for stopping by our sleepy little village and for sharing with us. Good nutrition definitely goes hand in hand with good sleep – hungry babies generally don’t sleep very well, for sure! If her healthcare provider thinks her weight gain and health overall is okay enough to drop the first feed, then you can definitely start in that direction. You’d want to get this okay first before proceeding with any weaning – he/she may also be able to provide some guidance on how to go about it. However, if you’d like some expert help with weaning (once you have the okay!) and improving your family’s sleep, one of our sleep consultants will be able to walk you step by step through this process. Consider our Basic Email package, which you can read more about here: http://www.babysleepsite.com/services Hang in there, Lauren! She sometimes stays sleep for an hour or so. But often times she cries when she doesn’t feel the warmth of someone or can’t smell you. It’s very tiring as I have to have her near me in the bed . I don’t sleep well because I am always making sure that she is okay. Do you have any suggestions? How can I get her to sleep through the night? To sleep alone in her crib? When she cries after being put down to rest for a nap or for bed at night, I shhhh shhhhh her and say mommy’s here, you’re okay, you’re safe as I lie next to her which usually works. Sometimes it doesn’t and I pick her up to rock her and when that doesn’t work, it means she wants to be nursed. Thank you for your input and help advance. So if my child is waking up and seems hungry how do I wean this night feeding ? I hope this helps! Thank you for using the Baby Sleep Site as a resource for sleep! My first baby slept through from 10 weeks (10 hour stretches) I exclusively breastfed her until 6 months. I thought I was very lucky when my second started sleeping through (9 – 11 hour stretches) at 5 weeks. However at 12 weeks she started waking 3 times a night (between 9pm and 6am). She is now 5 months old and wakes 1 – 2 times per night. She is eating 2 meals a day after my doctor recommended starting solids at 4 months because she is a big baby. She is more interested in playing than feeding during the day. I know she is capable of sleeping through because she did it before. Am I unreasonable to expect her to do this? According to the quiz I am, but then my first shouldn’t have slept through either! @ Christine Hahn – good question! In your case, it sounds like you could probably drop one of those feeds without too much trouble (although I’d hesitate to drop both right away – your daughter may still need one nightly feeding). As for whether or not she’s ready – I’d try phasing out one night feed and then see how she does. I’d also make sure that your daughter is able to fall asleep independently (i.e. doesn’t have any sleep associations that may be causing her to wake at night and stay awake, between sleep cycles). 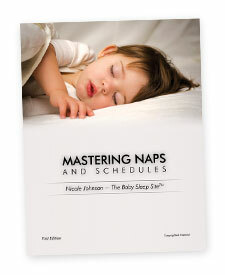 Often, babies who are able to fall asleep (and then back to sleep) on their own tend to night wean themselves.